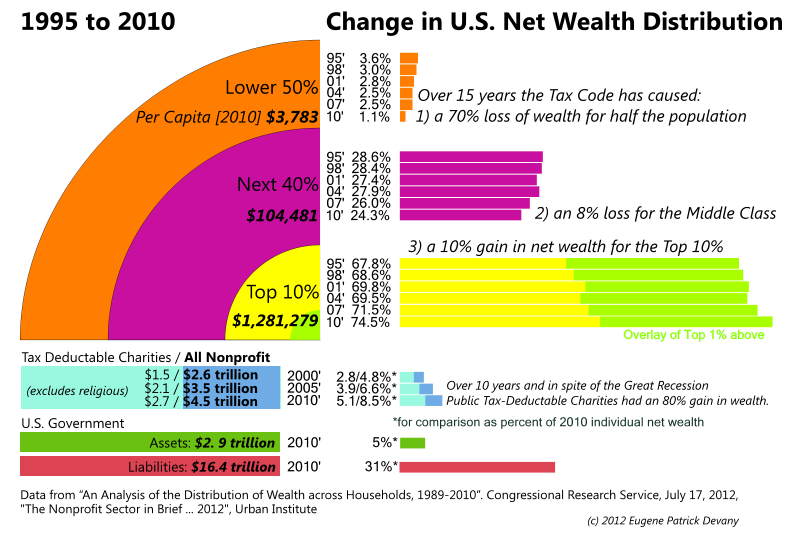 The above chart graphically shows how the tax code has resulted in a redistribution of wealth. Few people realize the extent to which poverty has grown in the U.S. and the extent to which prosperity has been concentrated in the nonprofit sector and the wealthiest 10%. On October 17, 2014 Janet L. Yellen, Chair of the Board of Governors of the Federal Reserve System srovided a summary of the latest wealth survey data through 2013. Figure 3 shows similar wealth data to that shown above. 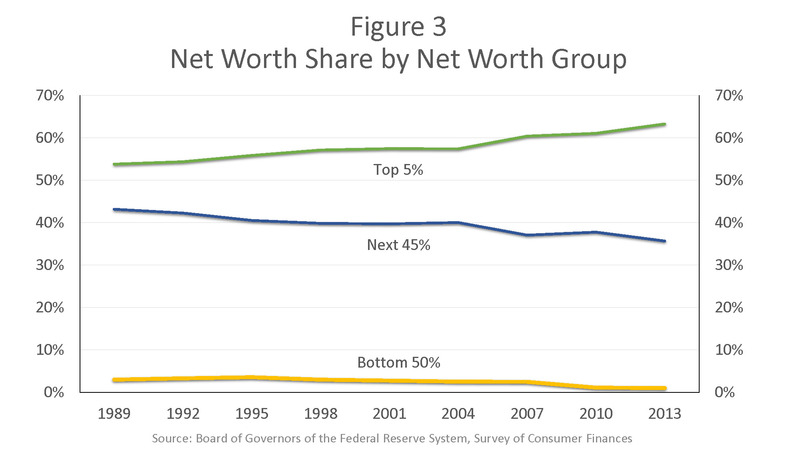 The poorer half of the population seems to have bottomed out with 1% of the wealth. “The inflation-adjusted net worth for the typical household was $87,992 in 2003. Ten years later, it was only $56,335, or a 36 percent decline, according to a study financed by the Russell Sage Foundation.” See NY Times, "The Typical Household, Now Worth a Third Less", "Wealth Levels, Wealth Inequality and the Great Recession", June 2014. Note that the "median" in the chart above would be at the exact point where the lower half (lower 50%) meets the middle class group (next 40%). "[T]he increasing differences between those few who grow ever richer and the many who grow hopelessly poorer, should be a cause for dismay," according to Pope Benedict XVI in his address to the Diplomatic Corps on January 7, 2013. See also Wealth Distribution Video based upon a survey of what people thought was the wealth distribution was and what they think it should be and chart comparing wealth distribution to map of USA.